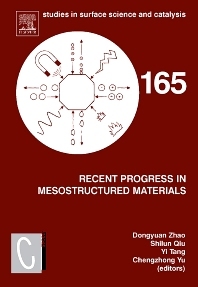 Recent Progress in Mesostructured Materials is a selection of oral and poster communications presented during the 5th International Mesostructured Materials Symposium (5th IMMS2006). Authorized by International Mesostructured Material Association (IMMA) and hosted by the Fudan University, China. The scope of this involved field covers both traditional inorganic mesostructured molecular sieves and mesostructured materials like organic polymers, metals, organic-inorganic nanocomposites, and ordered mesoporous carbons, the hot topics in chemistry, crystallization, structure, liquid crystalline, catalysis and materials science. This symposium provided a forum for the presentation of the most novel development and knowledge in the science and technology of mesostructured materials. Papers presented cover a wide range of topics that include synthesis, structure determination, characterisation, modelling, and application in catalysis, adsorption, biochemistry and advanced material sciences.